With a new school year starting soon, I thought it was important to spread the word on backpack safety. These days, children come home with backpacks full of gargantuan textbooks and binders overflowing with assignments and homework; which is great from an academic standpoint, but detrimental from a physical health point of view. In this blog post, you will learn how to properly wear a backpack, how to properly pack a backpack and the potential safety risks associated with incorrectly wearing a backpack. 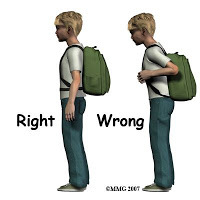 It may be a struggle to get your kids to wear their backpack on both shoulders, especially if they are in high school; but in order to maintain proper posture and avoid injuries, it is imperative that children of all ages utilize both shoulder straps. Also, when purchasing a backpack, make sure that the shoulder straps are padded and adjustable. The extra padding helps take pressure off the shoulders with heavier weight and the straps should be adjusted so the back of the backpack sits right up against your child’s back and the bottom of the backpack sits no lower than 4 inches from the waist to avoid hyperextension of the lumbar spine (low back). If the backpack has a chest and/or hip strap, encourage your child to use them. Use of these additional straps helps distribute the weight of the backpack more evenly and promote better posture. If your child complains of back, neck, or shoulder pain, especially associated with wearing their backpack, it is imperative to have them evaluated by a chiropractor as soon as possible to prevent any long-term effects such as spine/joint degeneration and chronic pain.